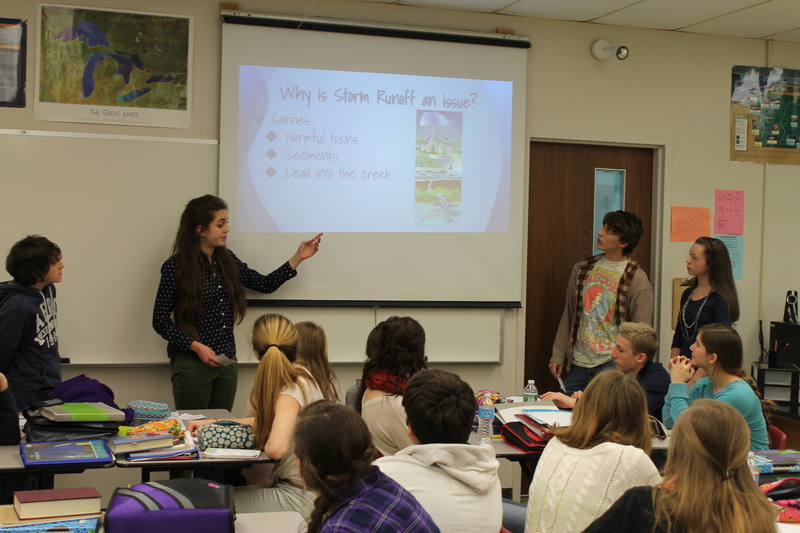 Students share impacts of stormwater runoff with their peers. Science students participating in the International Coastal Clean-Up in September 2013 . Teaching in Northwest Pennsylvania, I feel it is imperative that students are familiar with the Great Lakes and their importance. 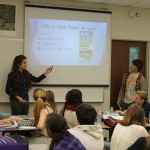 Despite the fact that my students live near Lake Erie, they often have little understanding of the lake’s importance or its connection to the other Great Lakes. I find that when students enter my classroom, they have very limited knowledge of the Great Lakes and how they are connected to them. Students need to be able to make a connection with a topic in order to better comprehend and care about that topic. Looking at the ways they influence the water quality in the Great Lakes, and how the Great Lakes influence them, is often an eye opening experience. If my students do not leave my classroom with a greater appreciation and knowledge of the Great Lakes, then I feel I have not done my job as a teacher. I try to make as many connections as I can to Lake Erie and the Great Lakes in general. One of my favorite activities is a water pollution lab that is modeled off a lab I did in a Project WET workshop. I have modified the lab to make connections to our local streams and Lake Erie. First, the students create polluted water by adding coffee grounds, paper, vinegar, soap, and oil to clean water. We discuss, as they are adding them, what each of those additives represent. For example, we talk about how coffee grounds are like sediment pollution and adding the grounds to the water simulates what may happen in a flood event or if there is a lot of erosion along a stream bank. Once the students know how their water has been polluted, they have to come up with ways to treat the water so that pollution doesn’t enter the Great Lakes. Some of their materials include cups, straws, spoons, cheesecloth, coffee filters, and gravel. Once they have devised a water treatment system, they then must carry out their procedure and analyze the results. The students have a great time doing the lab, and they learn about the difficulty of removing pollutants from our water. We get to discuss how water and wastes that go into storm drains are not filtered before emptying into streams. Another important topic is discussing the things that they struggled to remove, especially the soap. We begin discussing Prescription drugs and Personal Care Products (PPCPs) and their impacts on local waterways by using a presentation created by Anna McCartney from Pennsylvania Sea Grant. Often times, the issue of PPCPs is one the students do not know anything about but one they become very interested in. 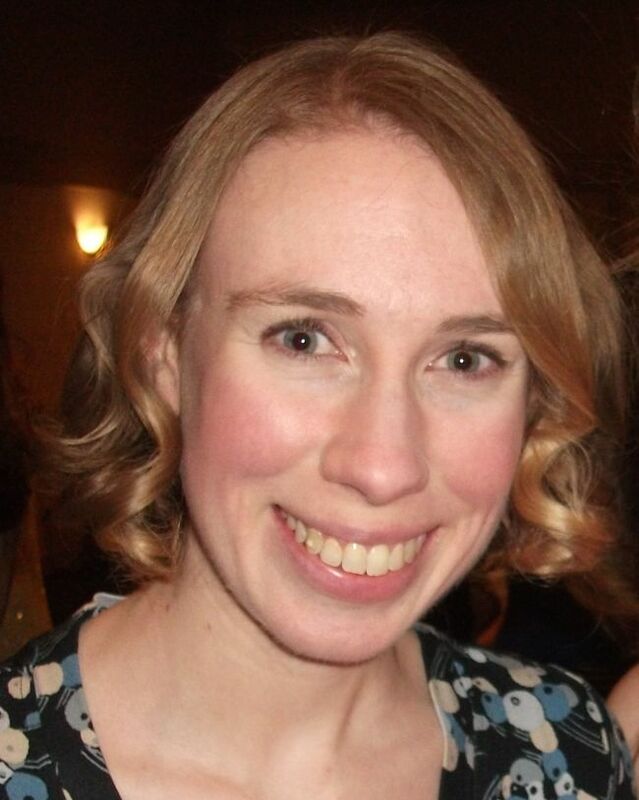 I have the students use the EWG’s Skin Deep website to see what is actually in the products they use everyday. Overall, this combination of activities gets the students very engaged and interested in what’s going into the Great Lakes and what they can do to reduce that pollution. I try to engage my students in a variety of ways. Many of my students are interested in what is going on in the news. With Lake Erie being almost completely frozen this year, we have been able to read articles and look at satellite images of the Great Lakes. Current stories, in the newspaper, online, or in magazines, help students feel that what we are talking about is relevant to them. Having students from the digital age means that they constantly want the newest information possible. They find it interesting to research facts about the lakes, invasive species, and local watersheds, as long as they can do some of that research online. They also enjoy hands-on activities. We will go out and do water quality sampling in Trout Run, a local creek, this spring and connect that to water quality in Lake Erie. I also try to do trips, either to Presque Isle or the Tom Ridge Environmental Center to get students more exposure to their environment and additional resources I could not provide at school. This year, we are also participating in an activity that will make a watershed map game of our local watershed. 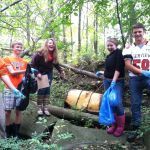 This project, coordinated through Destination Erie, will hopefully help students to see the positive assets in their community as well as how the watersheds throughout the area are connected to the health of Lake Erie. Finally, a lot of my students live either by a stream that flows into Lake Erie or on the lake itself. Making connections to where they live is also vitally important. A group of my students is concerned about the nutrient pollution and litter that are found along a section of Trout Run that is in their backyard. They have done video interviews with people who are near the creek to gather more information. Allowing students to utilize their technology to access and convey information helps increase their engagement in Great Lakes activities. My students’ complete Earth Action projects, which are environmental stewardship projects. When students are working on these projects, I try to help them connect with as many people as possible to help achieve their goals. This has meant, in the past, that they make connections with local scientists. Some of these scientists are at the collegiate level; my students communicated with one professor about local erosion issues. Another time, they worked with people from the DEP and Fish and Boat Commission. I feel that it is important that students not be afraid to ask help and seek the advice of scientists who are wonderful resources. Most of the scientists I have dealt with have been pleasantly surprised that high school students are interested in topics, and usually they are happy to be of assistance. My students also had a unique experience in the fall to speak with Dr. Edwin Masteller, Professor Emeritus of Biology at Penn State Behrend. Dr. Masteller shared with the students a small snippet of his vast knowledge of insects, and the students were captivated by what he had to say. Despite the fact that the students had done many hands on activities throughout the day, hearing Dr. Masteller speak was what they found most interesting. My students participated in the ICC in the fall of 2013. 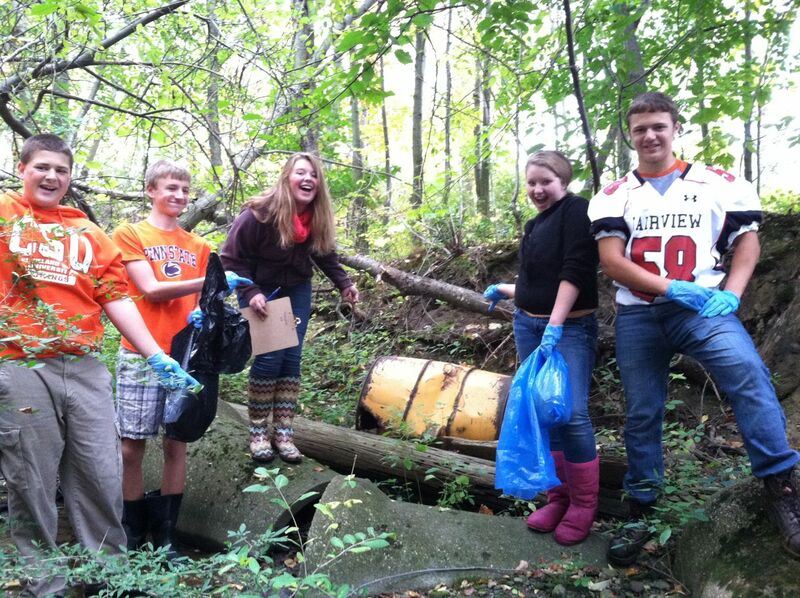 We chose to clean up a stream called Trout Run that flows along the school property and then empties into Lake Erie. The students shared their experiences with other students and were published in the Principal’s Pride report. My students were surprised at what they found in the creek, and many of them chose to reflect on the experience. I also do Earth Action projects with my students. Through these, they pick something that they feel is an issue, in the community or in the school, and then come up with an environmental community service project to help make a change. Over the years, my students have done projects that include raising awareness of invasive species, planting a rain garden, creating a PSA about recycling, and planting trees. In all of these, we tie in connections about how these projects can make a positive change on the Great Lakes.